Home › Business Relationships › “Collector Stands Up for a Debtor”: The exception or the rule? “Collector Stands Up for a Debtor”: The exception or the rule? A self-described “story with an interesting twist” caught my eye last week. I follow Mike Gibb’s blog, Daily Digest, on AccountsRecovery.net. On 2/19/14, his “twist” was “A collection agency is standing up on behalf of a debtor against a creditor.” A click on Gibb’s “read more” link led me to a Public Citizen, Consumer Law & Policy Blog posted 2/18/14. Their post began, “We don’t often have occasion to praise debt collectors on this site, so it’s worth taking note when a debt collection company does the right thing.” Having worked in the debt collection industry for more than 20 years, I disagreed completely with the implied premise that a debt collection company doesn’t often do the right thing or deserve praise for what they do. My years of experience with collection agency and law firm owners and managers, debt collectors and attorneys, has been just the opposite. The people I know spend their days doing the difficult job of helping debtors find a way to pay their bills, and in the process, they help individual businesses and the economy in general in ways that we don’t often read about. I see that as the rule rather than the exception. In the Public Citizen blog, the praise was for debt collector Fidelity Information Corp, the owner of the debt, said to be the result of an online retailer, KlearGear, trying to extort $3500 from a customer because his wife criticized the company online. When Fidelity was included in a suit against KlearGear, they did “an independent review of the case and reported to the credit agencies that the debt was erroneous,” because it was based on a “non-disparagement clause” which was unenforceable. The erroneously maligned “debtors” voluntarily dismissed Fidelity from the lawsuit. An online search for other sources of “praise for debtors” led me to an interesting little book, The Debt: Collections Made Human, by Bill Arnold, a former debt collector and now a Certified Speaking Professional. Thinking I couldn’t purchase the book in time to meet my deadline, I called Arnold and found that he personifies many if not most of the debt collectors I’ve had the privilege of knowing over the years. He graciously sent me a short summary of the advice in the book that he said I could share with our readers. He seemed especially pleased that I wanted to portray the debt collection industry in a positive light. 3. Motivate the debtor to act by selling the benefits of paying in full, and help him or her find a way to do it. This approach became so successful that CSC Credit Services purchased my collection company. It provided me the opportunity to conduct over 2000 seminars with companies like Shell Oil, Bank of America, Wells Fargo, GE Capital and many other leading credit providers. That same day, I found I could “borrow” Arnold’s book on my Kindle and started reading it immediately. The advice in the book is imbedded in a fictional story about a debtor and the collector trying to collect the debt with help from a wise boss. It’s a quick read that you might want to refer to more than once, but I’ll take the liberty of summarizing what I think are the most important ideas Arnold proposes and that are not that uncommon among the industry members I’m acquainted with. 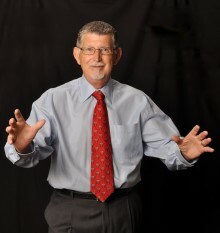 Bill Arnold has earned the highest designation of “Certified Speaking Professional” in the National Speakers Association. As a result of his business accomplishments, he received an honorary Doctor of Laws degree from Freed-Hardeman University. He is the author of three books. You can buy “The Debt” on Arnold’s website or on Amazon.com. Reading this book might help you be even better at what you already do. I’m glad I ran across this article. I spent 9 years in the collections industry and am well aware of the stigma that goes along with it. It’s nice to see it discussed in a positive light once in a while.